We create menus for your special events. Please call Casey Sarno at 617 738 4810 for menus and more information. We create menus for your catered experience. Please call Casey Sarno at 617 738 4810 for menus and more information. Everything made by hand from the best ingredients. Serve everything from aged steaks to simple-yet-unique pasta creations. Mirror this philosophy in the kitchen with our expert and attentive staff in the dining room, seeing to your every need and taking pride in your enjoyment of the meal. Steve has since opened locations in Foxborough, Lynnfield, Chestnut Hill, Philadelphia, Manhattan and Atlanta. Easter Dinner Dste. Food was amazing. Drinks and service were good. The bolognese mad me feel a bit sick. I live in Newton, so Davios in Chestnut Hill is my go to place, in case I am out of ideas. It consistently has good food, superb service and lovely bar scene on the weekends. This time, however, the food was rather mediocre. The chicken livers were bitter and waaay over-fried, and the calamari appetizer lost its visual appeal whatsoever: it looked like either someone ate it before it arrived at my table, or perhaps a wrong choice of plate and too little calamari. The desserts were delicious and the drinks were fantastic. The service never disappointed. Have always had a good meal. Service has also been very good there. The pasta dishes are always great and had the dry aged ribeye which was very flavorful and cooked perfectly. It was our first visit and won’t be our last from start to finish was fabulous service food and ambiance. We were very impressed my husband and I thoroughly enjoyed it definitely be back . Food was delicious, service was very good. Only problem I had was , we were sat in the bar area and kitchen noise was very loud. Next time we go I will request other seating, otherwise everything was excellent. I arranged a business dinner last night at Davio’s in Chestnut hill for a party of four. Two of us arrived a bit early and we sat at the bar and had a cocktail while we waited. The bartender was very personable and the drinks were well made. We were then seated promptly when the rest of our party arrived and greeted by a friendly, knowledgeable waiter. The only part of the food that was exceptional was the side of expertly prepared Brussel’s sprouts – delish! The $50 ribeye that I ordered was cooked as I asked however that is the only positive feedback that I have for it. The meat was not seasoned, tasted like the grill had not been cleaned in a few days, and was a bit on the tough side – Even after adding butter it was not that great. Finishing our meal with an Italian cookie and espresso totally sealed the deal on my resolve to never return to Davio’s – the cookie was mediocre and the espresso was awful. Such a shame that an upscale restaurant falls short of quality food. 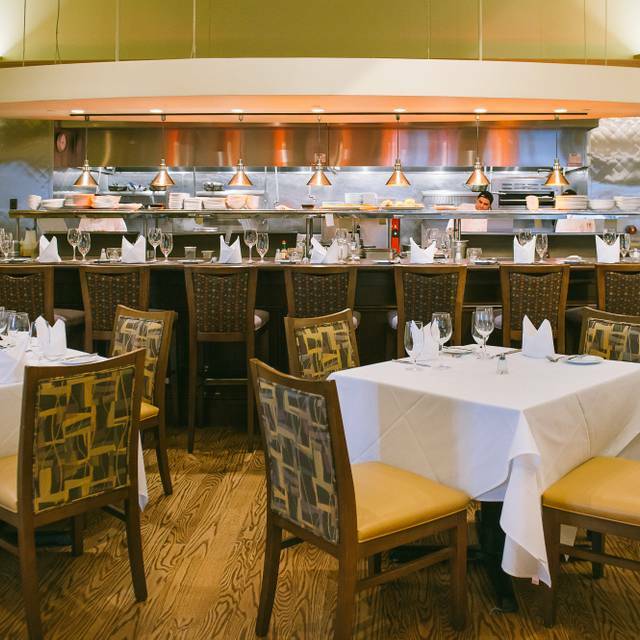 Davio’s is our go-to place for special occasions as well as everyday fun. Everything was great -- great table, as requested. However, when i made the reservation via Open Table I had indicated it was a birthday, and I called the restaurant earlier that day to provide the birthday name, but there was no birthday recognition at dessert time, as expected. Excellent service and just right for a casual work dinner. The food and service was excellent. My wife and I sometimes go to the bar for late night drinks and the popovers. The popovers are superb and worth the visit. Many bars can make great drinks but Davio’s has great drinks and the popovers. Service was excellent. I do not remember our server's name, but she was fantastic. Very attentive, but not overbearing. Knowledgeable, courteous. Food is always excellent. Love the popovers! The food, service and ambiance were amazing. A little noise but not too bad. I would definitely go back. Great for groups, pretty around sunset if you sit near the large windows. Everything was great except the seating. The front section was closed due to two functions so we had to sit in the area next to the kitchen and bar. We want a table, not a booth and they only have a limited number of tables. Became very loud with pots and pans banging, etc. Otherwise, the food and service was great. I would recommend it if you can get a table in the front section!! Outstanding server; delicious food and well drawn drinks. Amazing service and staff! Made a special day even more wonderful! I had made a reservation at Davio’s for my sister’s 30th birthday with some girlfriends and we all loved the experience! The food was amazing, our waitress was beyond accommodating, and they called me ahead of my reservation to make sure they could accommodate a birthday dessert ahead of time for my sister. She had a wonderful time, and so did we! We had a very pleasant evening. Excellent food. I would especially recommend their seafood appetizer large plate. Service was remarkable. I would definitely go back! Food was delicious. We all enjoyed our meals. I ate from the Awaken 180 menu and loved it. Chicken liver appetizer delicious. Grilled chicken sandwich was quality and fresh. For dessert I had 2 scoops gelato- heavenly! Parking for handicapped was very convenient as was entrance and exit from restaurant. Excellent dining for lunch. Quiet and delicious food. Very reasonable price for such high quality. The meal was great, and the service was impressive. We went to Davio's during Restaurant week for two friend's 60th birthdays. Everything was fantastic! The service was warm and impeccable. The food was fantastic. The pasta dishes are the best. Even if you normally skip pasta dishes for health reasons, splurge when you visit Davio's!!! Davio's Chestnut Hill is disappointing in so many ways: flavorless food, uninspired menu offerings, and food preparation that smacks of indifference rather than passion. And the food really and truly is flavorless across the board. If you’re seeking out a pricey restaurant that excels in mediocrity, then Davio’s Chestnut Hill is your kind of place. My wife and I went for the Dine Out Boston specials. We had been eyeing this restaurant for many years, so this was a chance to try it out. My wife had cod and I paid the $10 supplement for a steak. Both meals were excellent. The glass of Merlot I ordered was nice. Our waiter, Jimmy, did a fine job of keeping us supplied and tending to our needs. We appreciate him very much! We sat in the area near the kitchen, which while pleasant, is hardly a place where I would normally go for a fine meal. However, if you want to eat before or after a movie, either the bar or the kitchen area would be fine. The manager is thoughtful and professional. Always a wonderful experience. Fabulous food, nice environment. Parking can be tricky because of the nearby cinema. Davios in Chestnut Hill continues to be my “ go to “ restaurant whether business or personal. They are very accommodating, the food is outstanding and my guests always enjoy the atmosphere. Well done!!! Excellent food and service. It can be a very expensive restaurant depending on your menu choices, but for really good food well worth it. A pleasant dining experience for the family. I especially appreciated the call earlier in the day to determine whose birthday it was. Food was good. Service was slow ... more leisurely that we are used to and not apparently because of problems in the kitchen. The one suggestion I would make deals with the portion size of the desserts. They are very large. A smaller serving of cheesecake would have sufficed! Excellent service and delicious food. Great location. It's busy on Saturday nights so be sure to make a reservation. Perfect. Some minor confusion about a side dish. It was picked up by staff and quickly straightened out. And the deserts were removed from the bill which was not necessary, but welcome.